Home › Latest News › HOW FAR WILL YOUR TEST RIDE TAKE YOU? HOW FAR WILL YOUR TEST RIDE TAKE YOU? 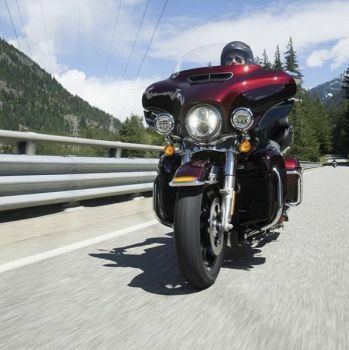 Harley-Davidson® Touring motorcycles are legendary. Since 1903, Harley-Davidson®Motor Company has fulfilled dreams of personal freedom and its Touring machines are the epitome of freedom.The 2017 model range of these mile-eating machines are now available to view and test ride at Shaws. Visit us and “Discover More” about the new Milwaukee-Eight® engines and chassis details that ensure the latest generation of Harley-Davidson Touring motorcycles are simply the best. Book and take a test ride on one of the new Harley-Davidson Touring* models and you can be entered into a free-of-charge competition to win a “money can’t buy” prize. A brand new Harley-Davidson® “Discover More” video shows exactly what that prize involves. The Discover More prize includes a flight for two to America, a personal guided tour with Bill Davidson of the famed Harley-Davidson Museum, a riding tour of the Great Lakes, and a Harley-Davidson®Touring* motorcycle of your choice to keep! This will then be followed by a factory visit to see your chosen motorcycle being built. Last but not least, a goodbye weekend in New York with £2000 to spend! And when you finally arrive home, your chosen Touring* motorcycle will be ready and waiting for collection. And all of this from taking a test ride! Book a test ride online, or visit us at Shaws to arrange a convenient time with one of our sales team. But don’t forget that to be entered into the “Discover More” competition, a test ride must be booked by the 30th April and completed before 15th May 2017.